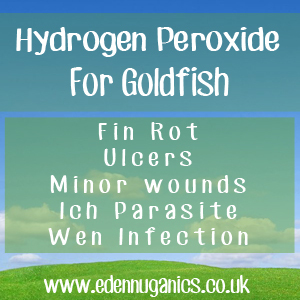 Hydrogen peroxide is an extremely popular treatment for a wide range of common goldfish health issues. This powerful disinfectant is able to eliminate unwanted bacteria as well as preventing contamination of tank water and promoting general good health. Not only is this treatment completely natural, but H2O2 is also one of the most affordable solutions available making it the go-to treatment for experienced fish keepers and the money-savvy hobbyist alike. Furthermore, the U.S. Food and Drug Administration (FDA) recently approved a hydrogen-peroxide-based aquaculture product, which has spurred greater interest in its use. Fin rot - Fins start to appear frayed or ragged, as if they've been torn. Ulcers - Ulcers are open sores on the surface of the body of the goldfish, which look like red, white or pink wounds. Minor wounds - Cuts, scrapes or bumps. Ich Parasite - Goldfish ich (Ichthyophthirius multifiliis) is one of the most common fish parasites found in aquariums. If left untreated, ich can kill goldfish. Wen Infection - A hole in the goldfish's head caused by bacteria. The first step is to wash your hands thoroughly. This stage is extremely important as many household chemicals are toxic to fish. Remove the ailing fish from the tank by hand as nets can harm the delicate scales of goldfish. Using a q-tip, dab a small amount of 3% food grade Hydrogen Peroxide over the affected part of the fish's body. Return your fish to the tank. You will be able to observe bubbles coming from the treated area, this is a good sign that the disinfectant is working. Repeat the procedure twice daily until the desired results are achieved. When looking to clean green algae from your fish tank, the recommended solution is in the range of 12ml per 50L up to 38ml per 50L. eg. 60ml of hydrogen peroxide in a 250L tank. This will be sufficient to remove unwanted algae before it rapidly converts back into harmless oxygen and water within 24 hours. Care must be taken though with the quantity added, as overdosing the tank with hydrogen peroxide can be fatal to certain species of plants, snails, shrimps, frogs, and fish! Salt - This might sound slightly odd for a fresh water fish. However, goldfish are able to tolerate a surprisingly high concentration of saline in their environment. Himalayan salt (not table salt as it has other chemicals added) can be added to tanks in differing amounts, depending on the problem. When using salt in your fish tank, it must always be added pre-dissolved as flakes can cause burns to your fish. Simply take a cup full of water from the tank and dissolve the required dosage before adding it to your pets living environment. Warnings: While goldfish can withstand very high concentrations of this mineral, salt should not be overdosed or used very often as it is known to deplete oxygen in the water. Baking Soda - Baking soda is another powerful remedy for our aquatic friends. It is known to speed up the healing process of fin rot and is widely used as a means of balancing the pH levels of tank water. A dosage of 1 teaspoon per 10 litres of water should be used. The hydrogen peroxide treatment can also be administered during this time.